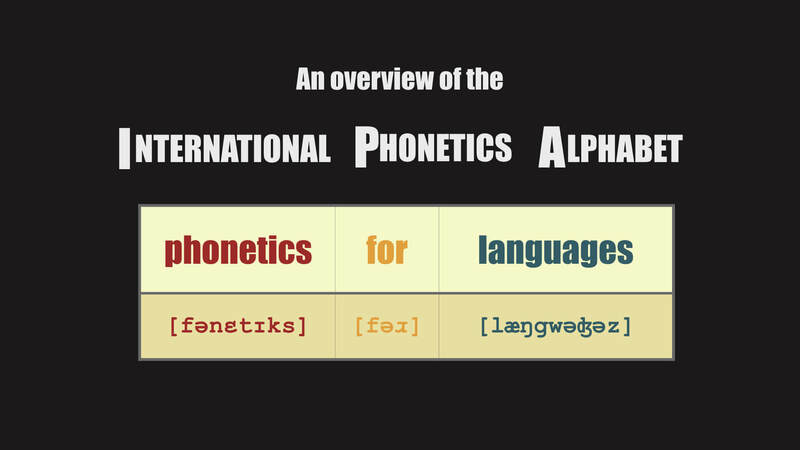 The International Phonetic Alphabet (IPA) is a fantastic tool for language learners of any language. It’s somewhat surprising that many language students have never heard of it. Luckily that is now no longer you! At the end of this post you will understand how to use the IPA chart to clarify the pronunciation of any word in any language. 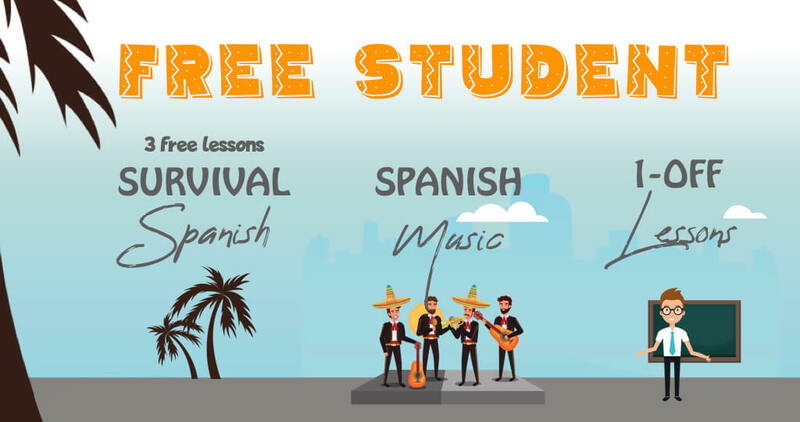 Once you have the IPA basics down, go to our next post on how you can use the chart specifically to help you with your Spanish. Let’s start by explaining what the IPA chart is. 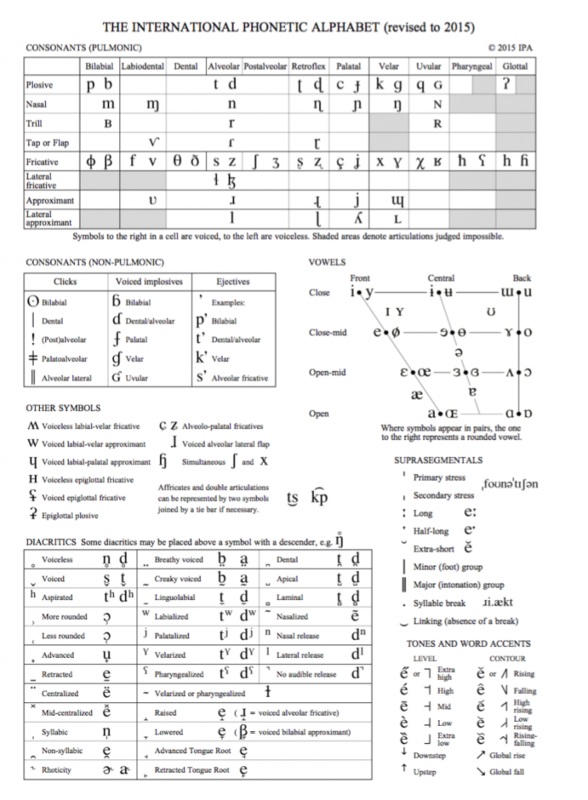 Its is an alphabetic system of phonetic notation. It’s a universal way to transcribe the sound of any and all spoken languages. And given what it can do, it’s amazing in its simplicity! This all encompassing system can be printed on just one page. 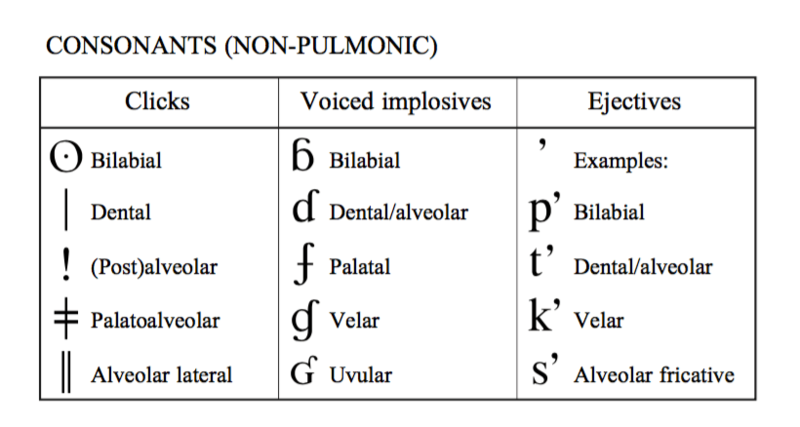 There are 7 sections to the chart, including consonants and other symbols, vowels, non-pulmonic consonants, diacritics, suprasegmentals, tones / word accents. Even though it’s only one page, your first look at it can be disorienting. But once you understand the basics, you can use it to go as deep as you like. We’ll guide you through each element of the chart, but the most useful for English speakers learning any of the romance languages are the consonants and vowels section. Let’s jump in, starting with the consonants. The consonants table represents all the consonant sounds made in language. There are 59 in total – that’s only 59 consonant sounds representing ALL oral language! In English (general American), we are familiar with 24 of these. This gives you a great start – you already know nearly half! Take a look at the chart below. The sounds that exist in English are highlighted in green. Let’s look closer at these sounds you already know from English, then we can address the sounds you don’t. 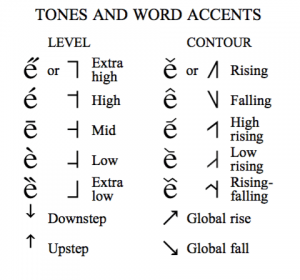 A note about the Other Symbols section; these are simply additional consonant sounds that would have been in the chart, but for the extra space they would have required to be placed in separate columns. A note about ‘r’ sound. In the IPA, the English r sound is represented by the symbol [ɹ]. However, you may see it noted as [r] for ease of typesetting. But as you’ll see below, in phonetic transcription, the [r] represents the trill you find in Spanish. There are a number of symbols that were not highlighted in green, since they are not found in the spoken English language, but in other languages. Learning which of these sounds exist in your target language (but don’t exist in your native language) helps you identify common pitfalls and pronunciation errors. Also it means you’ll likely have to work a little harder with these sounds since they are much more foreign to you. We highlight some of these in Spanish in our post on the 4 essential keys to Spanish pronunciation. There are a few common sounds which combine 2 consonant sounds. These are known as affricates or co-articulated consonants. The sounds are in fact created by simultaneously combining two sounds, but are often though of as a unique sound. In English we find two main samples. The first is the ‘j’ sound in jump, written [dʒ], this being a combination of the [d] as in dog and the [ʒ] as in beige. The second is the ‘ch’ sound as in cheat, written as [tʃ] . This is a combination of the[t] as in toe and the [ʃ] as in sheep. There are some sounds that have voiced and voiceless counter parts. This is interesting because they are sounds that are produced with the exact same positioning of the mouth and tongue, but there is a difference is how you move sound through your mouth, or specifically, whether or not your larynx vibrates when you make the sound. You can see this in the example of the words ‘think‘ and ‘then‘. The ‘th‘ in think is represented as [θ]. The ‘th‘ in then is represented by [ð]. If you say them each out loud to yourself, you’ll notice how in the beginning of the word ‘think’, you don’t engage your vocal chords, but you feel their vibration at the beginning of the pronunciation of ‘then’. In the consonant table, voiced vs voiceless symbols appear in the same cell, next to each other. The one on the left is always voiceless, the one on the right, voiced. Their location on the chart shows they are produced in the same manner in the mouth, with the only difference being the engagement of the larynx. We’ll describe more about the implications of the chart layout in the following section. You may not have thought much about how you configure your mouth when you speak, because it’s so natural to you. But with every syllible we are manuvering specific parts of our mouth, throat, and tongue to make the sounds of our language. The IPA chart was designed to indicates how each sound is created, by specifying where in the mouth it is produced and in what manner it is produced. This can be really important if you are struggling to pronounce a word in another language correctly. The intersection between the two types gives you the location and manner which the sound is made. So, a fricative labiodental is created with your bottom lip and top teeth (labiodental) being pressed together (fricative) to give you, for example, ‘f‘as in father (or a v as in voice, if it’s voiceless). Similarly, the voiceless ‘p‘ sound as in ‘put‘ is found in the intersection of plosive- bilabial. Plosive sounds (or sometimes referred to as stop sounds) are consonant sounds formed by completely stopping airflow. And not surprisingly, bilabial means using both lips. We won’t go through all the detail here, but suffice it to say that as you move along the top axis, from left to right, the sound is produced further back in your mouth, starting at bilabial and ending at glottal. There are 28 vocal vowel sounds in spoken languages around the world, 13 of which are used in general American English. The English vowel sounds are highlighted in green below. Did you know that Spanish only uses 5! You’ll notice that the vowel sounds also do not generally correspond with the alphabetic letters in the written word. They are also not as precise as consonants and so there can be different interpretations or variations as to which symbol is used to represent a particular language, word or accent. We suffice with an overview here. As we saw with consonants, vowel sounds can also be combined to make more specific sounds. With vowels these are commonly referred to as diphthongs. Again, there is variation to which representation is used for a particular language, accent or word. Here we present the three listed by Iowa state’s speech site. 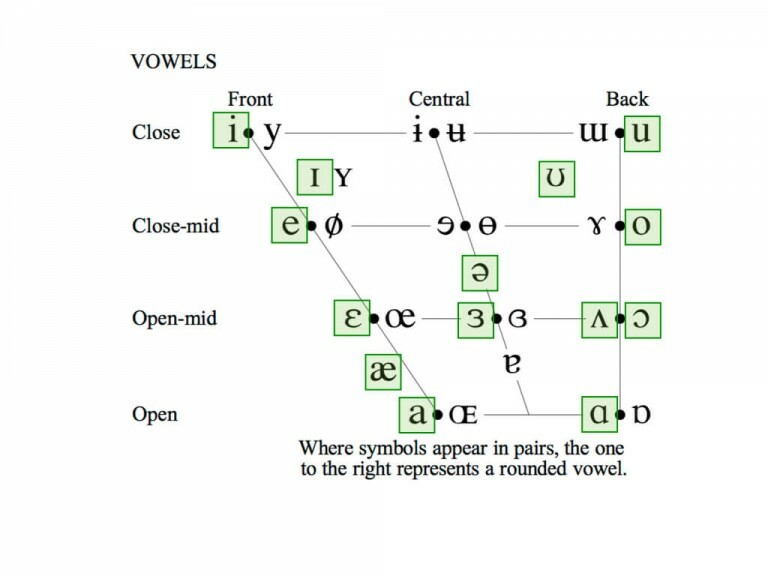 Again the layout of the vowels chart represents how and where the sound is produced. For vowels, the tongue is an import part of vocalization. As your tongue move from front to back on the chart it corresponds to the position in your mouth. Moving your tongue closer to the top of your mouth closes opening for air flow. This is represented on the chart going from from closed to open. Now let’s use the chart to look at an example of how you might use it to help you learn languages. Now let’s look at some words written out phonetically, taking into account with either an American and an English accent. Look at the following examples, first comparing American and British English, followed by English vs Spanish. If you were trying to learn a British accent, this would be helpful in highlighting the differences in pronounciation. You can see in the British version it is nearly pronounced the same except there is no [r] sound at the end of the word. So, we can use the phonetic alphabet to denote different accents within a single language. For example, if you were an actor, you could use words written out for you phonetically to learn a British or American accent. The same could be done for Spanish from Spain, vs Southern Spain vs Mexico or Argentina etc. 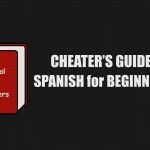 Now let’s look at how we might use it to help your Spanish. Look at the following example between the English word for mother and, coincidentally, the Spanish word for mother, madre. Notice the phonetic transcription of the two words. In particular, how the same symbol [ð] is used in both words, even though the spelling is quite different. Most English speakers would pronounce the d in madre, as the hard [d] sound as in ‘dog’. But most d sounds in Spanish are actually pronounced as [ð], as in then in English*. Try pronouncing [maðre] now, concentrating on softening that ‘d’; into a voiced ‘th‘ or [ð] sound. 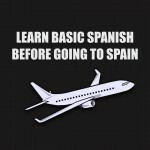 The nuanced Spanish d sound is something many English speakers don’t pick up on right away, but can go a long way to helping you sound more authentic. In a future post we will exam more examples of how the IPA chart can help you with your Spanish pronunciation. 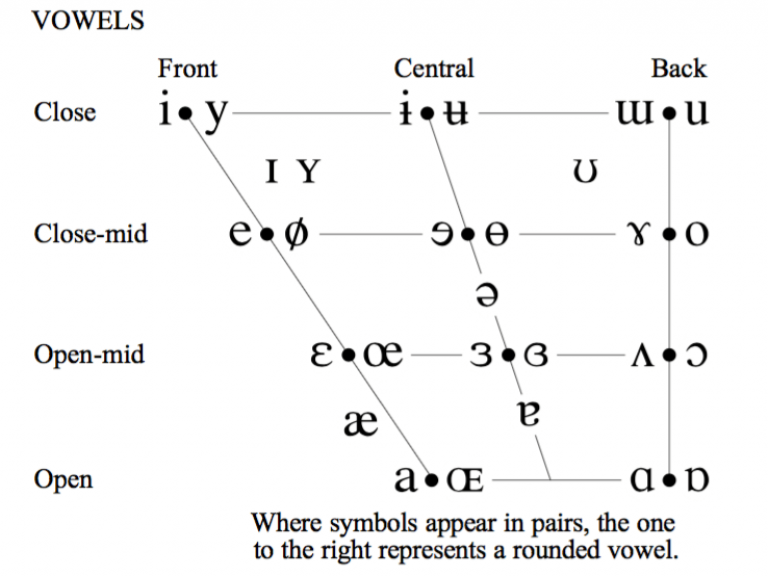 Each symbol of the consonants and vowels charts represents a single sound found in language, but there are additional accents and marks etc which extend the chart to further refine difference between sounds in different languages. They are not always used, but can be used in cases where more specificity is desired. 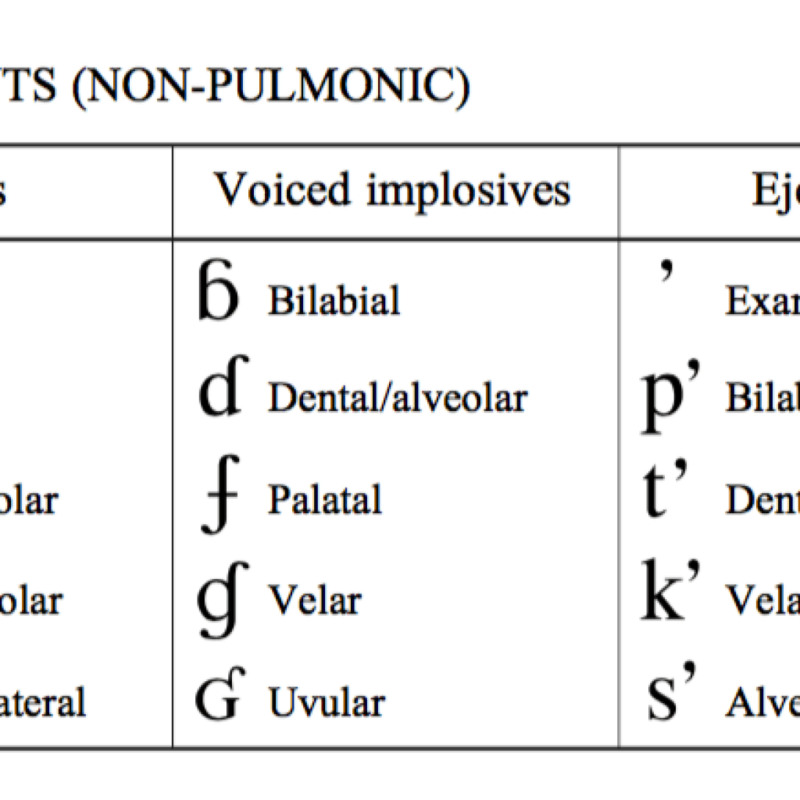 These are unique consonant sounds that do not rely on airflow to make the sound. They are a series of clicks and stops etc. None of these sounds are represented in English. Several are found in languages of Africa, including Swahilli or in vietnamese or indigineous languages of the Americas. 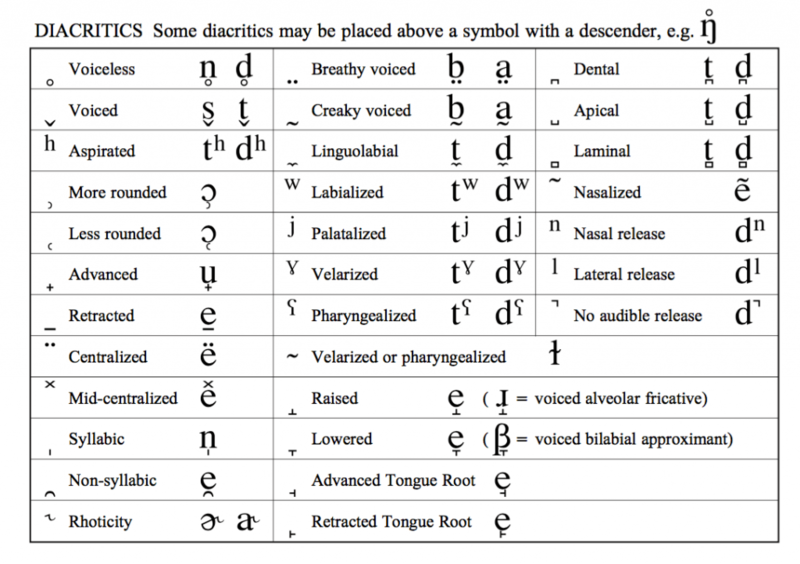 Diacritics allow us to add nuance to the standardized sounds, which allows us to expand the size of the IPA chart by denoting smaller differences between sounds. It denotes small adjustments to how the sound is created, for example … We will not go through them here but more information than you probably ever wanted to know on them can be found on Wikipedia here. These represent rising or falling tones within a language. These are seen in Chinese, Vietnamese, Thai, and Hmong as well as many African languages. For more complex and precise notation of tones, systems other than the IPA are sometimes used. If you’re interested in tones, there’s more information here. 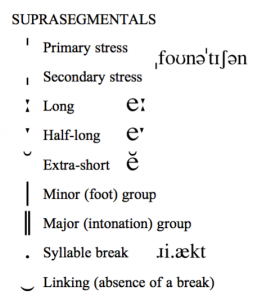 The suprasegmentals represent length, tone, stress and intonation. This can be helpful when looking at the rhythm of the language, and where to put word emphasis. For example, the mark for primary stress is written [ˈ ] and can be very useful for pronunciation. For example, the word emphasis can be written [ˈɛmfəsəs], showing the stress on the beginning of the word. If you say it out loud you can see this is true. If you found this post helpful or useful, please consider liking or sharing it!